Once a decaying railroad track looming ominously over a stretch of Manhattan’s West Side, from the blood-stained streets of the Meatpacking District to the bottom of Hell’s Kitchen, the High Line was transformed into a lush urban garden in the sky in 2009. 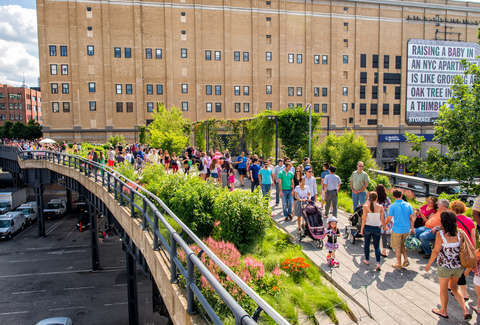 What began as an urban experiment is now an elevated park with a unique vantage on the city. For nearly a mile and a half, visitors and locals mingle, taking in killer views of the Hudson River, Lower Manhattan, and the Statue of Liberty. The park lives up to its hard-to-kill history. The garden design flanking a concrete walkway was inspired by the wild landscape growing on the rails during the 25 years after trains stopped running. The grasses, flowers, shrubs, and trees were chosen for their hardiness, sustainability, and variation. 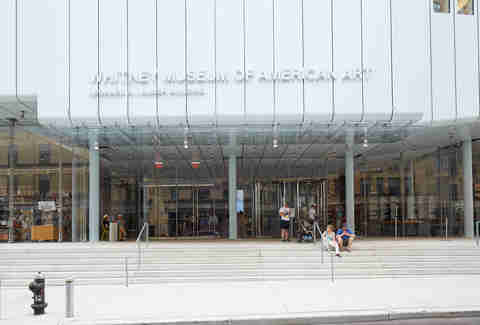 You should go there if you want a great spot for a date, or to people watch, to sunbathe, to loll, to chill, to snuggle. Find your way there anytime between 7am till 7pm in the winter, until 10pm in the spring/fall, and until 11pm during summer. 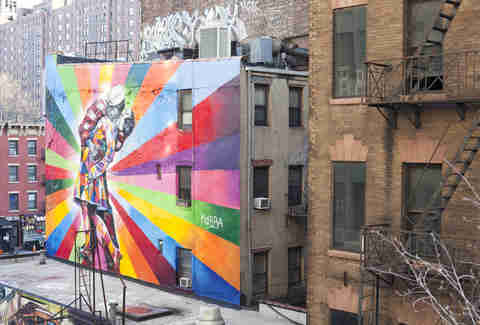 It’s a year-round attraction, rescued from urban decay, that has become integral to Manhattan. But putting all of that aside? It’s just a great place for an outing. Here’s what you should get up to when you go high. 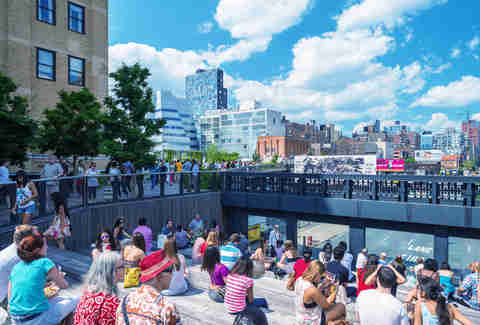 There are 11 entry points at intervals along the High Line, but for the optimal experience start at the southern end, at Gansevoort Street and Washington Street in the Meatpacking District. From there, the path leads you under the The Standard hotel, near Chelsea Market and past several iconic art galleries. At the park’s northernmost point, you’ll find the Interim Walkway, designed to celebrate the surrounding urban landscape. The path empties out at street level at 34th Street between 11th and 12th Avenues at Hudson Yards, a few avenues from Penn Station. Hear the story behind this urban wonder with free public tours led by volunteer guides, who will explain the park's design, history, horticulture, and art while pointing out all the best spots. Tours usually start at noon on Saturdays (check the timetable), at the Gansevoort Street entrance to the High Line. The entire walk is lined with public art, murals, sculpture, and video installations. The works change every year, but our current favorites are Henry Taylor’s mural, a self-portrait on the side of a building at W 22nd Street, and Sheila Hicks’ colorful textile sculptures. There’s also a rotating selection of video artwork along the 14th Street Passage: Mutations explores the relationship between man and nature, with pieces scattered throughout the park. Rest your legs at this overhanging amphitheater with wooden stadium seating, and indulge in some of the best people watching the city has to offer as busy New Yorkers dart and scurry below. Don't forget to look up, or you'll miss views of the Statue of Liberty to the south and the Hudson River just over your shoulder. At W 30th Street the original rail lines have been refurbished into a kids’ play area and are now on display. But don’t worry, the steel beams are coated in child-friendly silicon. Watch as your kids clamber and climb and generally knock themselves out (not literally) -- if you want to join in, we won’t judge. The Standard, a watering hole for celebs, was famous even before Solange and JAY-Z were caught on video fighting in the hotel elevator. Today, foot traffic from the High Line often spills over into the bustling Biergarten, which has a rotating selection of German beers, sausages, pretzels, and beer, as well as two ping-pong tables for entertaining the crowds. In winter, there’s an outdoor ice rink too, so you can impress the A-listers with pirouettes as they walk in. 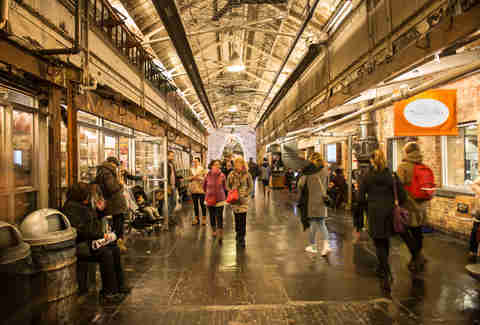 Head to the Chelsea Market Passage at W 16th Street during the warmer months for seasonal pop-ups. Our favorites this past year include the People’s Pops and Blue Bottle Coffee. 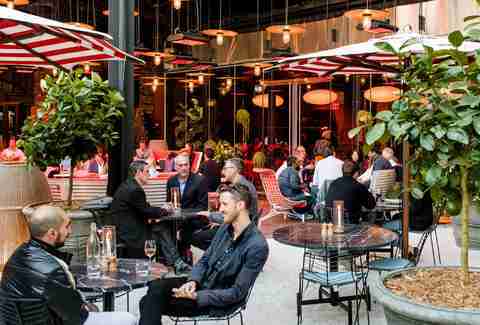 There’s also a seasonal, outdoor restaurant there called Terroir for small plates and wine. 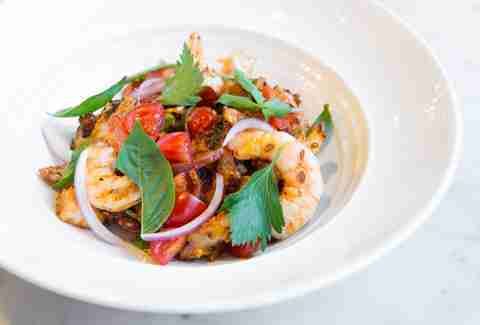 For the splurge, go for Italian at Santina, a sleek, glassed-in space under the High Line known for its seafood, or be seen next door at the Danny Meyer’s Untitled, on the ground floor of the Whitney. For more on where to eat and drink, check our guide. 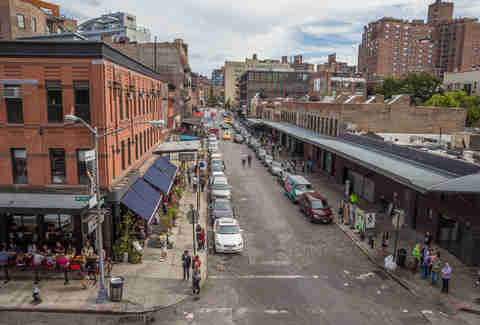 No trip to the High Line would be complete without a stop at Chelsea Market, a former Nabisco factory and now one of the most recognized spots on the West Side. The market is full of independent shops, food stalls and pop-up markets. Artists & Fleas features over 150 different designers selling clothes, jewelry, and original art. For high-quality pots and pans, head to Bowery Kitchen Supply, or duck into the Lobster Place for some quick sushi or a lobster roll. Posman Books is the go-to for games, toys, cards, and lots and lots of books. Just a few blocks off the High Line in the W 20s is the massive, state-of-the-art sports complex that is Chelsea Piers. You name it, and you can probably play it -- golf, rock climbing, soccer, and bowling are among the most popular activities. In winter, check out the Sky Rink for ice skating at Pier 61. Oh, and there are also two indoor soccer fields, two basketball courts, and four batting cages. Guests and locals alike meet up in this hotel’s trendy lobby and Intelligentsia coffee bar during the day, which turns into a bar in the evening. 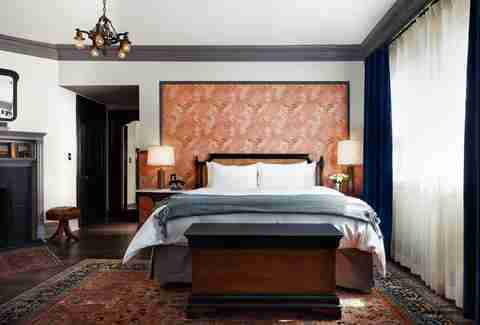 The former General Theological Seminary recalls the past with 19th-century gothic moldings, fireplaces, and antique touches like 1920s rotary phones. The historic, red-brick building still has its original stained-glass windows and pine floors. Shinola bikes are available and dogs are welcome. There's also a huge outdoor patio for drinks, and it’s just across the road from the High Line. Jennifer Mattson is a regular Thrillist contributor.